Russia-backed militants continued attacks in all sectors over the last day. Ukrainian troops recorded a total of 17 attacks. They returned fire 10 times. “Despite the decrease in number of attacks, the enemy continued firing upon Ukrainian troops with 120-mm mortars having fired about one hundred rounds,” said Ukrainian Ministry of Defense spokesman on ATO Colonel Oleksandr Motuzyanyk at a press-briefing at Ukraine Crisis Media Center. The situation in Luhansk sector was quite calm. In the second half of the day Russia-backed militants made four attacks in the area of Novhorodske, Novozvanivka, Luhanske and Novooleksandrivka. They did not use heavy weapons. Ukrainian troops returned fire twice using grenade launchers and large-caliber machine guns. In Donetsk sector Russian proxies made an intense attack from sniper weapons and small arms near Pavlopil in the morning. After 15:00 Russia-backed militant groups fired 75 rounds from 120-mm mortars upon Ukrainian troops. “The enemy also mortared Ukrainian positions near Chermalyk and Talakivka with 120-mm mortars, attacked the positions near Vodyane, Avdiivka and Novotroyitske with 82-mm mortars. A total of sixteen 120-mm mortar rounds and fifteen 82-mm mortar rounds were recorded in this area,” Colonel Motuzyanyk said. Militants also fired small arms and grenade launchers near Maryinka, Vodyane, Avdiivka and Novotroyitske. “Ukrainian troops returned almost each hostile attack with precision fire from grenade launchers, small arms and the weapons mounted on infantry fighting vehicles,” the ATO spokesman said. 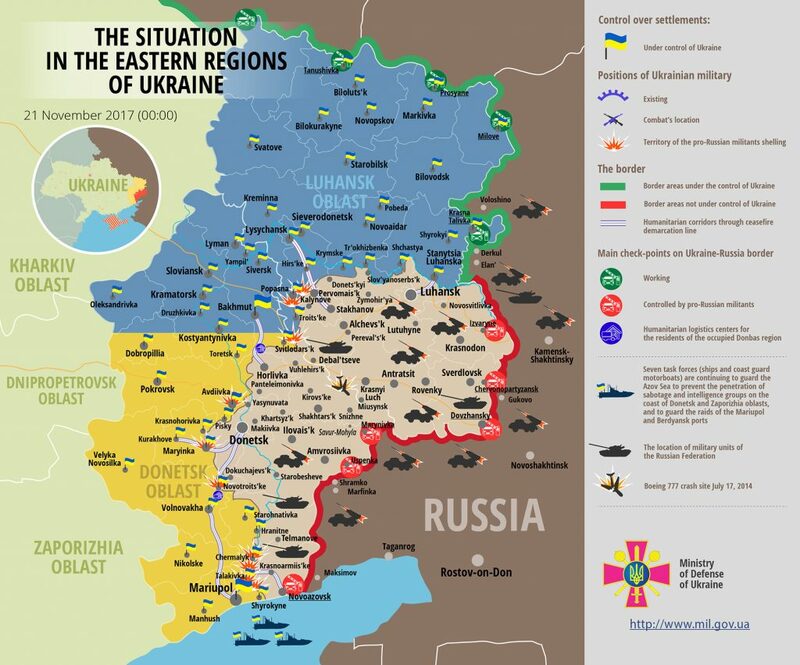 One Ukrainian serviceman was killed in action over the last day. The incident happened outside Pavlopil and resulted from a militant attack. Report on the military developments as of November 20 is available here. Interactive data on the shelling: chronology shelling chart and the interactive map.